This bakery felt the most out of the way and basic. It’s one you’d definitely have to be specifically looking for. You probably won’t notice it if you were to just pass by. 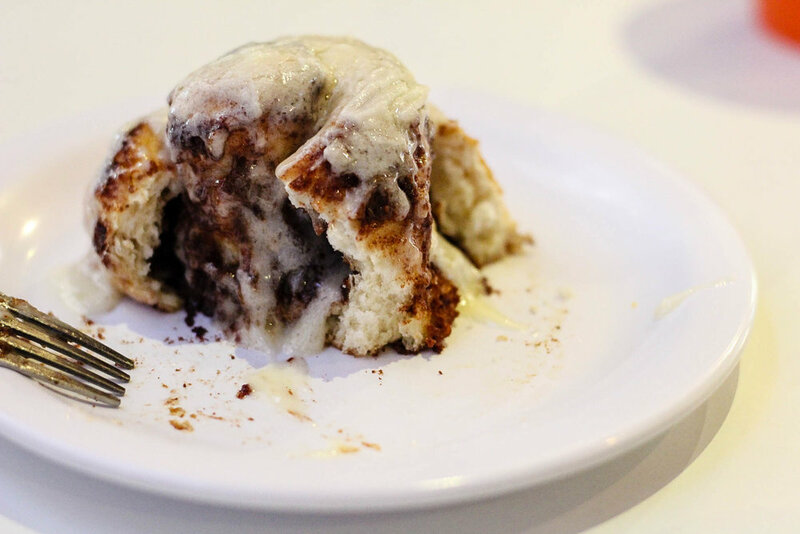 This cinnamon roll presented very well, by comparison to the others, and had a generous portion of thick frosting. Upon initial bites, the outer rings seemed a little tough and dry. The texture wasn’t quite what we were hoping for. 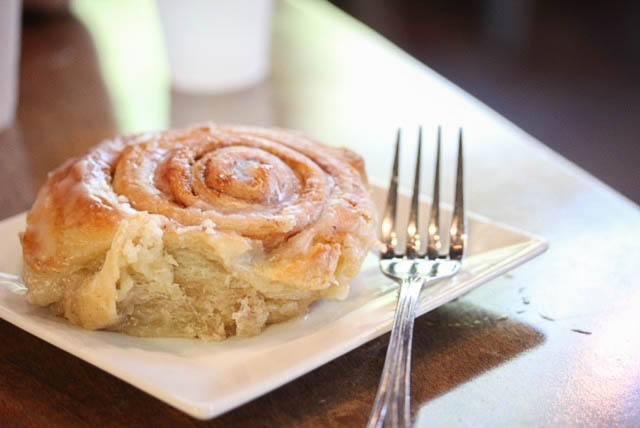 But as you unraveled the treat, and worked your way to the center, as any self-respecting consumer of spiraled pastries does, the gooey heart of this roll presented itself. Not the strongest start, but a very satisfying end. At first glance, McLain’s roll appears underwhelming. It actually looked like it was going to be dry, and had very little icing. But it turned out to have one of our favorite consistencies. The whole roll was doughy throughout. The icing functioned more as a sort of glaze rather than being lathered with frosting. As we ate it, we discussed what it reminded us of, and eventually settled on a feeling reminiscent of eating that perfect school cafeteria cinnamon roll. Highly recommended! You Say’s roll is definitely the largest of our sample. Hence most shareable. We actually had this one twice if that’s any sign of quality. Science is diligent, self-sacrificial work. It also has the largest portion of cinnamon, making it stand out from the others. An especially large amount of frosting pours off the roll and onto the plate. The exterior was chewy and crunchy, and its center maintained these characteristics. Very strong consistency. If choosing this location, respect should also be paid to their Pecan Roll. It should be noted that Emily almost backed out of our initial attempt on this one, as they seemed a little lackluster under the glass, and loves the pecan roll, but ended up pleasantly surprised! 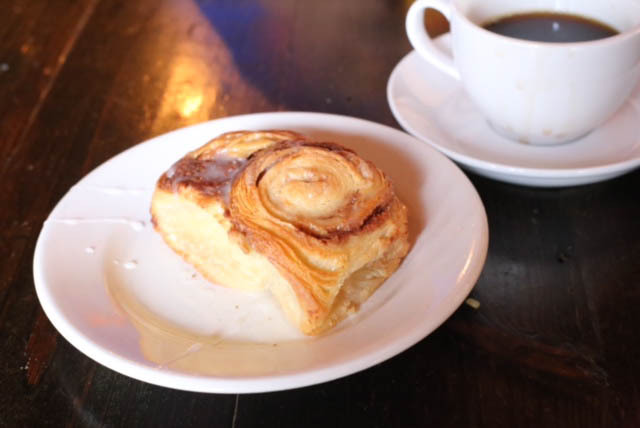 Corner’s cinnamon roll is actually a croissant cinnamon roll, unlike any of its peers. Never seen this before! It was also the flakiest one, and had the strongest buttery flavor. It really did melt in your mouth. It’s doughy, but had the least amount of cinnamon or sweetness to it. The frosting was more of a light coating. As opposed to You Say, it was the most petite and adorable in presentation. Not for sharing. Be selfish. Order your own, or at least fight for the bigger half. You deserve it. Dolce was one of the easiest bakeries to bounce in and out of. Everything churned along at a quick pace, and the roll itself was one of the only ones you could walk and eat with. No plate needed! Both in texture and size, it reminded us of a Danish. It was very bready and spongy, in a good way! 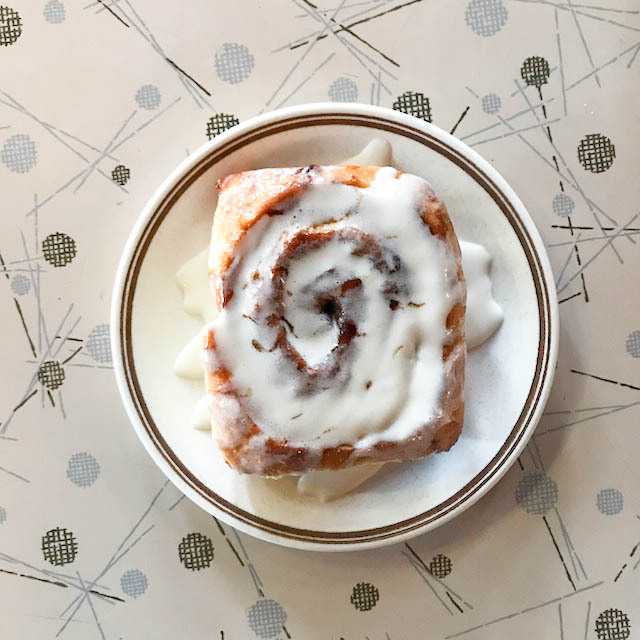 If you’re going that way, we recommend the orange roll over the standard cinnamon roll. They’re not as common and the zesty flavor made it a lot more memorable. This one really stood out, as they don’t even have a traditional roll available. Theirs was a Butterscotch Brioche Cinnamon Roll. It was certainly one of the most well presented. Just looking at it we got excited. With the butterscotch drizzle and the standard frosting, it was almost candy like. So much so, that it overpowered the cinnamon flavor. It was very soft and bready too. Word to the wise. They are only available on Friday, Saturday, and Sunday, and we’re told they generally tend to sell out by noon. Make the time! The Classic Cookie & Cafe. 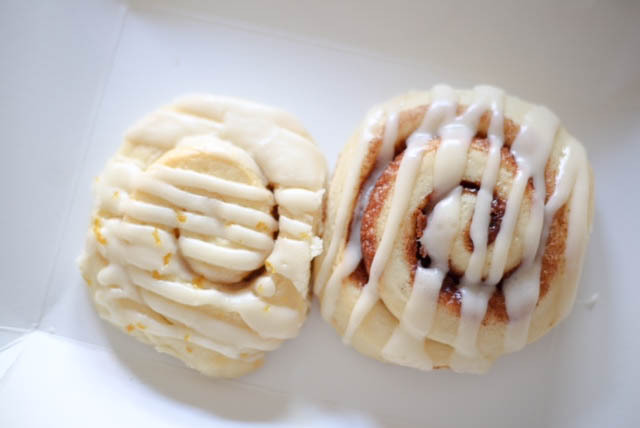 If you just close your eyes and picture a cinnamon roll, this is what you’d see. Perfect size for one, and had the thickest amount of very sweet, almost cake like frosting. They were some of the softest we had, but not really gooey at all. It doesn’t unravel or pull apart, so you’ll want to go full savage, and pick this one up with your bare hands. I guess you could use a fork if you want, but that seems so bourgeois. If you’re there for breakfast, this establishment is kind enough to let you throw the standard toast aside and substitute this treat for no additional charge. 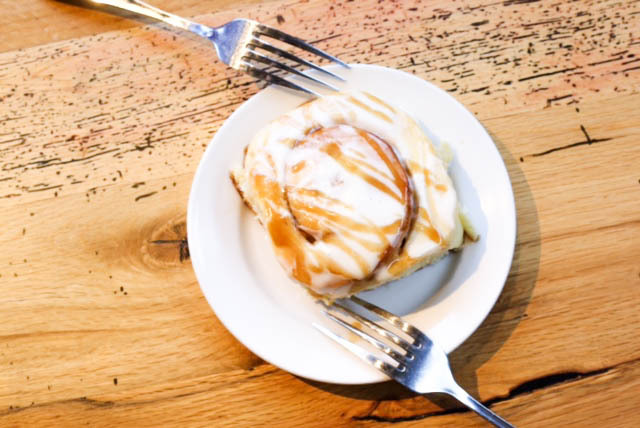 Sweetening up any savory breakfast you’d already chosen to indulge in.